Chuck Jonkey is an adventurer/composer/musician/filmmaker who transforms his wild experiences into sound, music and film. Chuck’s exotic adventures have taken him to the furthest reaches of primitive worlds. Referred to as an “ethnomusicianthropologist” Chuck travels around the world in search of adventure among the world’s most isolated tribal groups. His expeditions have taken him to the deep Amazon and rainforests of Thailand, Costa Rica, Guatemala, Brazil, Colombia, Indonesia, Peru and Mexico. Chuck’s travels have also taken him to West Africa, French Polynesia, Russia, China, India and many other countries. Chuck is the owner of the independent record label Sonic Safari Music. He has produced and published over 100 CDs of exotic music as well as producing several TV shows and documentaries. Chuck is the host of “Exotic Worlds” TV show (www.exoticworldstv.com) that has aired in several countries around the world. He was the host of the “Sonic Safari” radio show on KCSN for 1 year. Chuck has given many motivational audio/visual presentations to Universities, schools, churches, the Adventurers’ club and other civic groups. His music was featured in the 2012 Rose Parade. 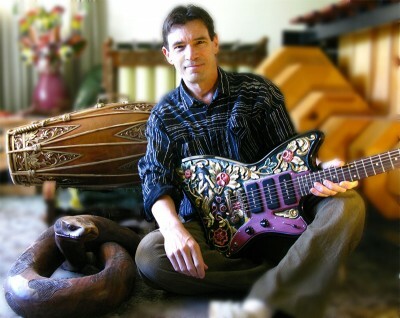 He is a member of the “Adventurers’ Club.” Chuck has invented a number of musical instruments. Chuck performed with the Manhattan Transfer on their CD “The Offbeat of Avenues” (they recorded one of his songs – “The Quietude”). The same song was re-recorded with a full orchestra on the Manhattan Transfer’s new Cd “The Symphony Sessions”. He was invited by RAVI SHANKAR to play with him at the National Cathedral in Washington, D.C.
Chuck Jonkey’s music has been featured in the following feature films & TV shows: “Rambo 4”, “In The Mix”, “Survivors”, “Proof of Life”, “Flubber”, “J.F.K.”, “The Doors”, “The Mighty Joe Young”, “Heaven on Earth”, “Travel Channel”, “The Film That Never Was” and many more. He has worked with Danny Elfman, James Horner, Ron Jones, Steven James Taylor and other film composers. “Travel Channel” aired a segment on Chuck as part of their “Amazing Vacation Videos” series. “Animal Planet” also has featured Chuck’s exotic animal footage. Chuck composed several hundred musical pieces for MICROSOFT’s software products. He spent 2 months journeying through Java & Bali recording, filming and documenting native music and dance. Chuck’s most recent expeditions have been to India, Thailand, Ukraine, Morocco and islands of the Carribean. EATING RAT IN THE AMAZON. One Amazon expedition included that very experience! Chuck was an honored guest of native amazonians who gave him a specially prepared rat for dinner. He lived in South America for 2 years (speaks fluent Spanish) where he started his collection of exotic artifacts. His collection of strange musical instruments is enormous. PEYOTE CEREMONY. Chuck was invited to a Ute-Navaho Indian peyote ceremony where he documented and recorded the entire ritual. NAKED HOLY MAN? A journey to India proved most interesting when Chuck was invited to an audience with a naked holy man. This small isolated sect of Jain holy men has renounced everything worldly (including clothes)! CAVE MUSIC? One of Chuck’s expeditions was to the depths of the Indonesian jungles to record Cave music.